Questions? Get in touch or browse our FAQs. What are the outdoor nativity sets made of? 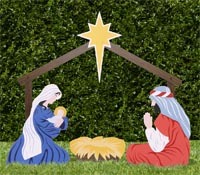 Unless otherwise indicated, all Outdoor Nativity Store yard nativity scenes are made with all-weather PVC plastic and printed with UV-resistant inks to resist fading. Can the outdoor nativity sets withstand harsh weather conditions like snow, rain, and strong winds? 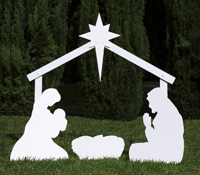 All Outdoor Nativity Store yard nativity scenes and plastic yard signs are designed for exposure to natural elements like snow, rain, and harsh sunlight. 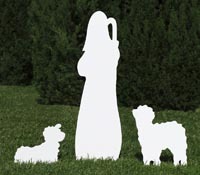 When properly installed with supplied in-ground stakes, our nativity sets and signs are designed to withstand wind gusts up to 20 mph. While many customers have shared stories of our products successfully enduring severe weather conditions, we cannot guarantee them against extreme and unpredictable acts of God. How hard is it to set up the outdoor nativity sets? It’s easy! 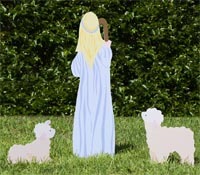 Our outdoor nativity scenes are designed for fast and easy setup with simple tools like a hammer or mallet. We provide detailed instructions in each package. Or you can watch our setup videos. Where can I install my outdoor nativity set? Outdoor Nativity Store’s nativity sets are designed for installation on a penetrable ground (soil, grass) that permits supporting stakes. Installation on hard surfaces (concrete, stone, wood, or solid soil) requires the purchase of additional components. We accept payment by Visa, MasterCard, American Express, and Discover credit cards, as well as checkout via PayPal. Orders outside of California are not subject to sales tax. Sales tax of 8.75% will be applied to all orders shipped to a California address. Orders below $49 – Cost calculated at checkout. Typically $3 to $8 per item. We try our very best to ship orders received before 4pm PST (Mon-Fri) the same day. Orders received after 4pm PST (Mon-Fri) are shipped the following business day. Orders placed on weekends and orders containing oversized items may take up to 48 hours to process. Continental US FedEx Ground or FedEx Home Delivery. Small items may ship via USPS First Class Mail (with tracking). Alaska, Hawaii, and Puerto Rico Orders generally ship via USPS Parcel Post. Oversize items ship via Fedex. Small items ship via USPS Priority Mail. Canada Orders generally ship via USPS Priority International. Oversize items ship via FedEx. All orders ship from Los Angeles, California. Below are the average expected transit times according to destination. Yes. As soon as your order ships, we’ll send you an email with tracking information. Do you ship outside of USA and Canada? Yes—but first you must contact us. International shipping rates apply and all duties or customs fees are the responsibility of the customer. Due to the oversized nature of most of our products international shipping (outside US/Canada) can be extremely expensive. Because of the oversized nature of our products, we are unable to ship orders to PO Box addresses. Yes. However, certain restrictions apply. We are unable to ship to addresses in Iraq/Afghanistan/Middle East, or Central America/South America/Caribbean. Please note that during the Christmas season (after Thanksgiving), shipments are likely to be anywhere from 4-6 weeks.